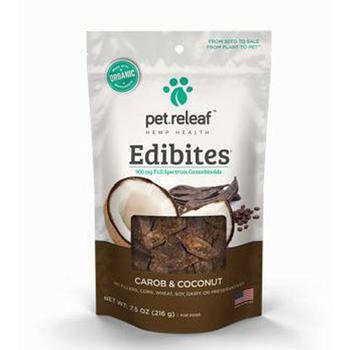 Our CBD-infused Carob Coconut CBD Hemp Oil Edibites are a “superfood smoothie” for your pet. They are considered an immune system turbo boost and are the perfect daily supplement for your pet. They contain no wheat, corn, dairy or soy and have no fillers or chemical preservatives. Each of our Carob Coconut CBD Hemp Oil Edibites contains 30mg of Full Spectrum Cannabinoids, 1.5 mg Active CBD. Our full spectrum CBD Hemp Oil that is utilized in our Carob Coconut CBD Hemp Oil Edibites is grown at the largest USDA certified organic hemp farm in the United States. We planted a specialized proprietary strain, PR-33, grown specifically with pets in mind. Since we use the entire plant (seeds and stalk), our CBD hemp oil provides all of the benefits of CBD while also providing the multitude of additional benefits provided by the terpenoids and flavonoids.